Breathing-related sleep disorder is marked by sleep disruption caused by abnormal breathing during sleep. The most common complaint of individuals with breathing-related sleep disorder is excessive daytime sleepiness, brought on by frequent interruptions of nocturnal, or nighttime, sleep. A less frequent complaint is insomnia or inability to sleep. Mental health professionals use the Diagnostic and Statistical Manual of Mental Disorders also known as the DSM to diagnose mental disorders. In the 2000 edition of this manual (the fourth edition, text revision, also known as DSM-IV-TR ) breathing-related sleep disorder is listed as one of several different primary sleep disor ders . Within the category of primary sleep disorders, it is classified as one of the dyssomnias, which are characterized by irregularities in the quality, timing, and amount of sleep. The DSM-IV-TR lists three types of breathing-related sleep disorder: obstructive sleep apnea syndrome (the most common type); central sleep apnea syndrome; and central alveolar hypoventilation syndrome. The most common feature of any breathing-related sleep disorder is interruption of the person's sleep leading to excessive daytime sleepiness. When the regular nighttime sleep of individuals is frequently interrupted, sleepiness at other times of the day is the usual result. People with breathing-related sleep disorder often find that they feel sleepy during such relaxing activities as reading or watching a movie. With extreme cases, the person may feel so sleepy that he or she falls asleep during activities that require alertness, such as talking, walking, or driving. Other people with breathing-related sleep disorder report having insomnia, or the inability to sleep. Patients also find that their sleep does not refresh them; they may awaken frequently during sleep, or have difficulty breathing while sleeping or lying down. The two sleep apnea syndromes that are listed as subtypes of breathing-related sleep disorder are characterized by episodes of airway blockage or stopping of breathing during sleep. Sleep apnea is potentially deadly. The other type of breathing-related sleep disorder, central alveolar hypoventilation syndrome, is distinguished from the other two subtypes by the fact that the reduced oxygen content of the blood is caused by shallow breathing. The alveoli, which are the tiny air sacs in the lung tissue, are not able to oxygenate the blood efficiently because the person is not breathing deeply enough. Shallow breathing often occurs when people are awake and is common in severely overweight individuals. A patient suffering from acute sleep apnea is hooked up to monitors in preparation for a night's sleep at a Stanford University lab. Many persons with the obstructive sleep apnea syndrome subtype of breathing-related sleep disorder are overweight. The symptoms often grow worse as the person's weight increases. Persons who have obstructive sleep apnea and are not overweight often have breathing passages that are narrowed by swollen tonsils, abnormally large adenoids, or other abnormalities of the various structures of the mouth and throat. Central sleep apnea syndrome is often associated with cardiac or neurological conditions affecting airflow regulation. It is a disorder that occurs most frequently in elderly patients. Patients diagnosed with central alveolar hypoventilation syndrome experience a breathing impairment related to abnormally low arterial oxygen levels. Obstructive sleep apnea syndrome, which is the most common type of breathing-related sleep disorder, is marked by frequent episodes of upper-airway obstruction during sleep. Patients with this syndrome alternate between loud snores or gasps and silent periods that usually last for 20–30 seconds. The snoring is caused by the partial blockage of the airway. The silent periods are caused by complete obstruction of the airway, which makes the patient's breathing stop. Obstructive sleep apnea syndrome is also common in children with enlarged tonsils. The symptoms of any breathing-related sleep disorder in children are often subtle and more difficult to diagnose. Children under five are more likely to demonstrate such nighttime symptoms as apnea and breathing difficulties. Children over five are more likely to demonstrate such daytime symptoms as sleepiness and attention difficulties. Persons with central sleep apnea syndrome experience periods when the oxygenation of blood in the lungs temporarily stops during sleep; but they do not suffer airway obstruction. Although these patients may snore, their snoring is usually mild and not a major complaint. Central alveolar hypoventilation syndrome is characterized by excessive sleepiness and insomnia. The majority of patients with the obstructive sleep apnea type of breathing-related sleep disorder are overweight, middle-aged males. Adult males are two to four times as likely as adult females to experience obstructive sleep apnea syndrome. Among children the male: female ratio is 1:1. Central sleep apnea syndrome is most common in the elderly. A diagnosis of breathing-related sleep disorder usually requires a thorough physical examination of the patient. The patient may be referred to an otorhinolaryngologist (a doctor who specializes in disorders of the ear, nose, and throat) for a detailed evaluation of the upper respiratory tract. The physical examination is followed by observation of the patient in a sleep clinic or laboratory. Breathing patterns, including episodes of snoring and apnea, are evaluated when the patient is connected to a device called a polysomnogram. The polysomnogram uses a set of electrodes to measure several different body functions associated with sleep, including heart rate, eye movements, brain waves, muscle activity, breathing, changes in blood oxygen concentration, and body position. Interviews are also conducted with the patient and his or her partner. 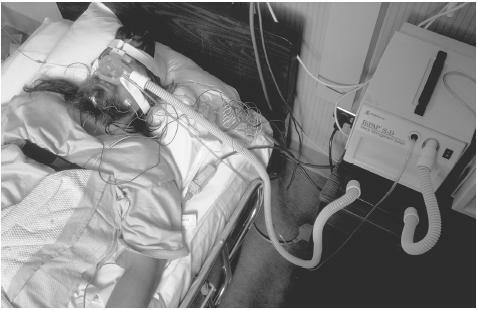 To meet criteria for the diagnosis of breathing-related sleep disorder, the patient must experience interruptions of sleep leading to insomnia or excessive sleepiness that have been determined to result from one of the following sleep-related breathing conditions: obstructive sleep apnea syndrome; central sleep apnea syndrome; or central alveolar hypoventilation syndrome. The disturbance in sleep must also not be better accounted for by another mental disorder or by a general medical condition not related to breathing. The disturbance in sleep must not be due to the direct effects on the body of a prescription medication or drug of abuse. Weight loss is a key to effective treatment of overweight people with breathing-related sleep disorder. It is often considered the first step in treating any disorder involving sleep apnea. Increased exercise and reduced-calorie diets are the most important components of an effective weight loss regimen. Nasal continuous positive airway pressure therapy, also known as nasal CPAP therapy, is a popular form of treatment for the obstructive sleep apnea subtype of breathing-related sleep disorder. Nasal CPAP therapy, which has been in use since 1981, involves the use of a high-pressure blower that delivers continuous air flow to a mask worn by the patient during sleep. The airflow from the nasal CPAP blower is often very effective in reducing or eliminating sleep apnea episodes. Nasal CPAP treatment is, however, inconvenient and somewhat noisy for anyone who must share a bedroom with the patient. Patients do not always comply with this form of treatment; one study indicated that about 25% of patients who are treated with nasal CPAP therapy stop using it within a year. Medications for patients with the sleep apnea subtype of breathing-related sleep disorder are most commonly such respiratory stimulants as medroxyprogesterone acetate (Depo-Provera) and acetazolamide (Diamox). Protriptyline (Vivactil), which is a tricyclic antidepressant, is also used for some patients. Surgery to relieve airway obstruction is increasingly preferred by many patients. If the airway obstruction is related to anatomical structures that are narrowing the airway, surgical reshaping of the soft palate and uvula (a small, conical-shaped piece of tissue attached to the middle of the soft palate) may be performed. Another surgical procedure that is sometimes done in very obese patients with obstructive sleep apnea is a tracheostomy, or an artificial opening made in the windpipe. This operation has a number of unpleasant side effects, however, and so is usually reserved for patients whose breathing related disorder is life-threatening. Patients with sleep apnea are advised to abstain from alcohol and sedative medications, which are often given to patients who display any type of sleeping irregularities. Alcohol and sedatives often increase the likelihood of upper airway problems during sleep. Breathing-related sleep disorder often has a gradual long-term progression and a chronic course. For this reason, many people have the disorder for years before seeking treatment. For many, symptoms worsen during middle age, causing people to seek treatment at that point. Successful treatment of other conditions, such as obesity , cardiac or neurological conditions in the elderly, or enlarged tonsils in children often aids in the treatment of breathing-related sleep disorder. Weight loss often leads to spontaneous resolution of the disorder. Because overweight people are more likely to develop the more common obstructive sleep apnea type of breathing-related sleep disorder, a good preventive measure is effective weight management. Good general health and treatment of related physiological conditions are also effective in preventing the disorder. Buysse, Daniel J., Charles M. Morin, and Charles F. Reynolds III. "Sleep Disorders." In Treatments of Psychiatric Disorders, edited by Glen O. Gabbard. 2nd edition. Washington, DC: American Psychiatric Press. Hobson, J. Allan, and Rosalia Silvestri. "Sleep and Its Disorders." In The Harvard Guide to Psychiatry, edited by Armand M. Nicholi, Jr., M.D. Cambridge, MA: Belknap Press of Harvard University Press, 1999. Saskin, Paul. "Obstructive Sleep Apnea: Treatment Options, Efficacy, and Effects." In Understanding Sleep: The Evaluation and Treatment of Sleep Disorders, edited by Mark R. Pressman, Ph.D., and William C. Orr, Ph.D. Washington, DC: American Psychological Association, 1997. Thorpy, Michael J., M.D., and Jan Yager, Ph.D. The Encyclopedia of Sleep and Sleep Disorders. 2nd edition. New York: Facts on File, 2001. American Sleep Apnea Association. 1424 K Street NW, Suite 302, Washington DC 20005. <http://www.sleepapnea.org> . American Sleep Disorders Association. 6301 Bandel Road NW, Suite 101, Rochester, MN 55901. <http://www.asda.org> .